80% of home buyers use the Internet as a resource for their home buying decisions. With so many people researching homes and companies before even speaking with a building professional, mastering internet marketing is crucial. There are so many aspects to it, though: website design, search engines, social networks, email marketing, content marketing, blogging, and more. As a home builder, how do you ensure you are implementing all of them efficiently? The answer is inbound marketing. 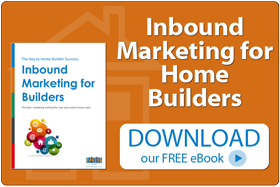 Inbound marketing for home builders is a step-by-step system focused on attracting prospects to your company and converting them into home buyers using marketing software, marketing automation, and strategic sales training. We’ve laid out the benefits of inbound marketing below. Once you’ve got those, head over to “How Builders Can Use Inbound Marketing to Sell More Homes” for more details on how the process works! Produces Qualified Leads – Inbound marketing is different from other forms of marketing. The method is strategically implemented to nurture leads through the sales process to ensure they are qualified before a sales professional contacts them. This means leads are already sufficiently interested when the sales professionals make contact. The leads welcome assistance and are easier to work with. Drives Traffic to Model Homes & Showrooms – Inbound marketing integrates each online marketing tactic to ensure more website visitors and social media fans actually move from checking out your homes and showrooms online to visiting them in person. Customer Relationship Management – The inbound marketing process creates more qualified leads. Once you have more leads, you need to manage them and follow up in an organized manner. Inbound marketing for home builders includes a powerful customer relationship management (CRM) system to help ensure you close more qualified leads. Includes Sales Training to Close More Leads – To follow up with leads, you need a strong sales strategy. Not only does the inbound marketing process for home builders produce more qualified leads, it also helps ensure you close more of those leads by providing professional builder sales training. Makes You the Home Building Expert in Your Market – Inbound marketing includes a content marketing strategy that provides a large amount of valuable, helpful information to home buyers. By providing this information, home buyers come to see you as your area’s home building expert, and your company’s reputation benefits. Ensure You Get Found Online Before Your Competition – Inbound marketing integrates all online marketing channels into one powerful campaign, ensuring your company has a dominant presence within search engine results and social media. Feel free to contact us at 1-855-372-8392 to learn more about how inbound marketing can help you sell more homes. This entry was posted in Blog, Builders & New Home Marketing, Content Marketing, Inbound Marketing, Internet Marketing, Uncategorized. Bookmark the permalink.